In the wake of last week’s strike, it was not the vitriol of Internet trolls that troubled me most; it was the quiet disbelief of friends. When they heard reports of police brutality at Sydney University, they responded with skepticism. Why would police officers arrest peaceful protesters unnecessarily? Trained to show restraint and presumably under orders to do so, why would one officer step on a student’s head, as he lay face-down on the ground, hands behind his back? And that most pernicious thought of all: if the police were violent, surely the protesters must have done something to provoke it? Before last Wednesday, I was uncertain. Police brutality was something that occurred in Turkish public squares and South African coalmines. Reports from the pickets – of police officers strangling and trampling students – were at odds with my few experiences of the police. Intuitively, most of us tend to think of the world as a good place, of people as well meaning, of the state as benevolent, of the police as doing a difficult job with some compassion. The explanation of the events offered by police spokespeople is that protesters broke laws: they resisted arrest or blocked traffic against picket protocol. That may have been true in some circumstances. But even if it is, the response from police was a disproportionate use of force. Shoving students against fences before asking them to move aside, using violence against an already subdued student. Eleven arrests: keep in mind that the current NSW Police Handbook refers to an arrest as an ‘extreme action’, advising officers to use other means of getting an individual to court. Arrest is supposed to only be used as a last resort, and certainly not for the dubious charge of swearing in public. An observer of the morning who was sympathetic to the police would still have to concede that the police used excessive force to counter minor wrongs on the part of the protesters. There are indications that the arrests were part of a premeditated plan to de-energise the picket by removing the most vocal and active protestors. Three people sighted a hand-written list of ‘ringleaders’ that one police officer was carrying – a number of those on the list were to spend part of their day at Newtown Police Station. 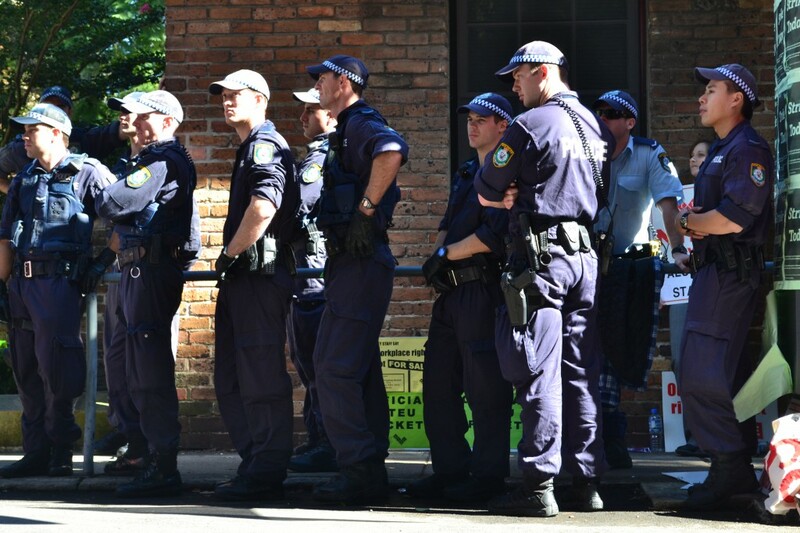 The length of time those protesters spent in custody (one sat in a police car parked outside the station for more than two hours), and the dubious charges laid against them – if any were – all suggests a demobilisation strategy. Of course, it is equally plausible that excessive police force wasn’t predetermined. The idea that it was a planned strategic manoeuvre may rationalise the actions of the police too much. After all, the police who were at the University on Wednesday were from the Public Order and Riot Squad (PORS). The officers in the PORS elect to join it, knowing that they will be involved in more violent actions than an ordinary police officer. It does not take an anarchist’s imagination to think that riot squad officers probably have more aggressive tendencies than average police officers, that they probably despise leftist protestors who call them pigs, and that the violence on Wednesday was an impromptu display of rage that they likely won’t be held accountable for. Whatever you think about the strikes and the pickets and the protesters, the excessive and arbitrary use of force by the state against its citizens is not something to be ambivalent about.